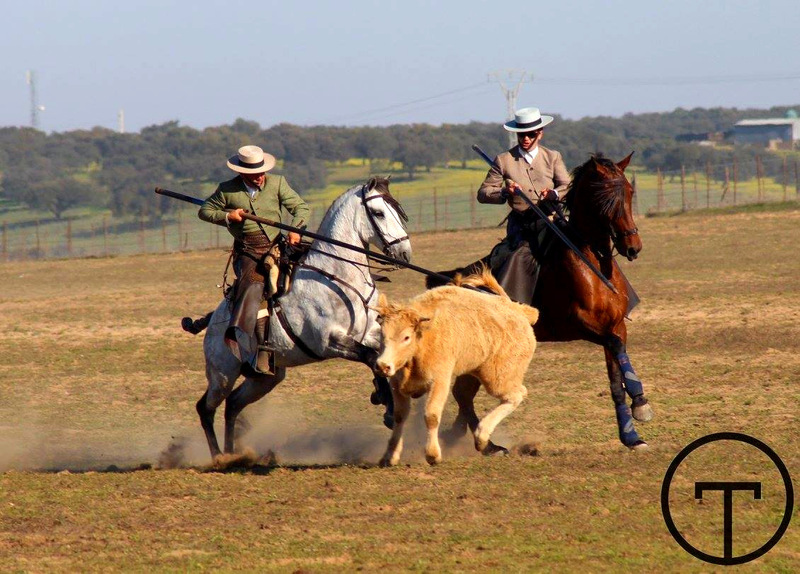 One of the more unusual units to see action during the Peninsular War were these "Garrochistas"
The Garrochistas were a sort of Andalusian cattlemen that used long lances to prod bulls! The wore their regional costume of (usually) green jackets, red head scarves, and broad hats. There lances were quite long. 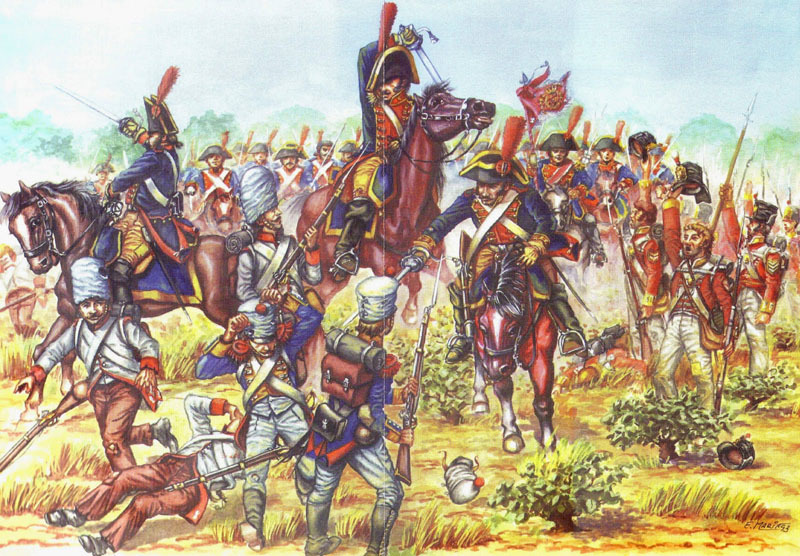 These Garrochistas participated in the defeat and surrender of Dupont's French at Bailen in 1808. These are once again 28mm Brigade Games figures sculpted by Paul Hicks. The Talavera Campaign in a Day with Snappy Nappy is tomorrow! Another drawing of a Garrochista. A pair of modern Garrochistas. As I understand it, they are a part of the Bull fighting shows as well. This regiment dates back to 1793, originally as the Carabineros de María Luisa, then becoming the Húsares de María Luisa in 1803. In 1808 the regiment was used to form the 1st and 2nd Húsares de Extremadura, which later merged back in to a single regiment. The same uniform was retained throughout, aside from a change from the Mirleton to a shako, starting perhaps as early as late 1809. The trumpeter wears "reversed colors" for the dolman and pelisse. The officer subsitutes silver for the white lace, and, oddly, even has silver epaulettes on the pelisse! A fantastic source for information on all of the Spanish Hussars (and for many other Spanish troops as well) can be found at the Little Wars site. These very nice castings are from Eagle figures, the only manufacturer I could find that does them in the fabulous Mirleton in 28 mm. With this uinit, we are back to "proper" 8 figure, 4 stand regiments! 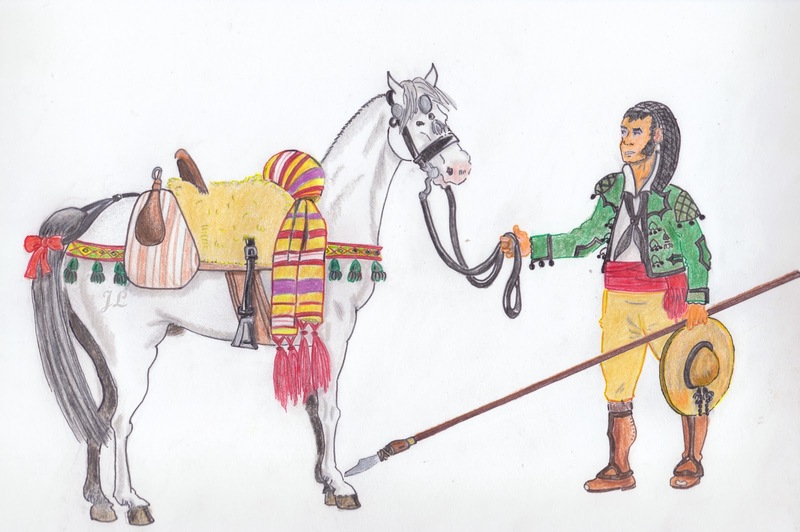 The Spanish Heavy Cavalry ("Line Cavalry"), like their infantry brethren, saw their uniforms undergo numerous changes in the earlier part of the Napoleonic Wars. in the late 1780's to 1790's, the regimnents wore coats in varied colors by regiment (dark blue, white, or scarlet) with regimental facing colors. In 1796, all regimnents changed to white coats with scarlet turnbacks and regimental facing colors. In 1800, the Cavalry of the Line wore dark blue coats with scarlet turnback and piping, buff breeches and waistcoats, pewter buttons, white lace on the beicornes, and scarlet saddle blankets edged in white. The regimental facing colors were as per the table below. In 1802, the uniform changed yet again, now with all units dressed the same, namely dark blue coats with white lapels, crimson collars, cuffs, and turnbacks, all of which were piped in white. The lapels were piped in crimson. The buttons were brass and the waistcoats yellow. The bicorns had a yellow lace edging. The pants were blue with a crimson stripe. Still another change occurred in the uniforms of the Heavy Cavalry in 1805, with a return to regimental facings on the dark blue coats, and a return to buff breeches and waistcoats. The saddle blankets remained dark blue, with the piping on the shabraques and the lace edging on the bicorns being in the regimental button color (yellow or white). * = piping in the text color (buff or white). This is the Algarve regiment of Line Cavalry; once again the trumpeter and standard bearer will be added soon. 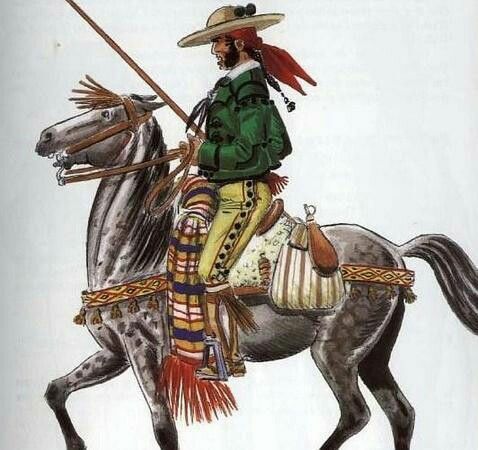 Being a regiment with Pewter buttons, the lace on the bicorn and the trim on the shabraques is white, as opposed to the yellow seen previously with the Regimiento del Rey. These are once again Brigade Games figures, sculpts b y Paul Hicks. This shot shows the buff color of the collars better. Curiously, the Algarve is the Southernmost region of Portugal, now days famous for its beaches. It was occupied by Spain from 1807 - 1808 as part of the joint invasion of Portugal with the French. They look quite dapper astride their chestnut horses, eh?! With our Snappy Nappy Peninsular Campaign in a Day just a little over a week away, I needed some more Spanish Command figures. I had 2 "left over" officer figures from my Brigade Games Dragoon regiments, so they were called up for service! The blue saddle blanket is a documented but not officially sanctioned variant for Generals; I used it for variety. Likewise the light blue sash - doubtless of some foreign military Order! I should probably go back and "black line" the gold/red transition on the (official) red saddle blanket. I have a lot more troop nearing completion in time for the event. I may or may not be able to post them all before then! The Lodestone Kickstarter - "modular magnetic tabletop buildings"
I happened across this Kickstarter which I hadn't seen promoted, and I thought the concept was very clever. The idea is to use some standard box configurations as the skeleton to which fully pre-painted mdf "skins are affixed, using strong earth magnets. This allows rapid assembly and disassembly, and reduced storage needs. What's more, the same basic boxes can potentially have a wide variety of different genre "skins" that can be used with them. They are currently looking at doing Sci-Fi, Western, and Gothic Fantasy, but imagine Mediterranean, Russian, and French skins for the Napoleonic era, Middle eastern skins, Oriental skins, Modern skins, Medieval skins, ACW skins.... all re using the same basic boxes as a framework. A huge variety of buildings would be possible with greatly reduced storage needs. 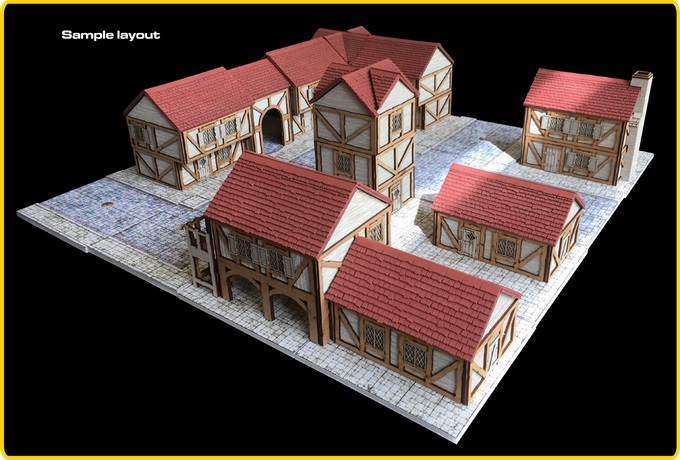 The buildings look to be geared to 25/28 mm figures (confirmed), without having overly large footprints. Check out their Kickstarter (a very well done presentation) if you are so inclined! I have no connection to these guys in any fashion, nor any idea how likely they are to be able to deliver the product (due May 2019). It looks like they showed the prototypes at Salute this month, though. Regimiento de Infanteria de Linea "Rey Immemorial"
For the sake of variety, I painted this regiment, the King's Own, in the earlier 1802 uniform. It is the oldest unit in the Spanish Army, originating before Spain was even a Kingdom. This uniform was a radical departure from the traditional white coats of Spanish infantry, and their individual facing colors. Instead all units were to wear an identical uniform featuring a dark sky blue coat with black collar, cuffs, and lapels. The shoulder straps and turnbacks were scarlet. The lapels and collars were piped scarlet; sources vary about the cuffs being piped scarlet as well, but Spanish sources seem to indicate they were left plain. All units had brass buttons and collar emblems. The usual red plume and red cockade of Spanish troops were worn with this uniform as well. Many of the troops in the Romana Division sent to the Baltic for service with the French were still wearing this uniform in 1807, despite the regulation changing back to white with varied facings in 1805. I also painted the last of the Front Rank Spanish Grenadiers that In bought way back in 2009. One company is in the same 1802 uniform, and the other is in the 1805 white uniform. If I remember correctly, the light blue facings are those of the Valencia regiment. Once again, those magnificent bearskins! The flag is that of the Valencia regiment., once again by Adolfo Ramos. The figure on the far right is a sapper, wearing a modified and shorter version of the Grenadier bearskin.